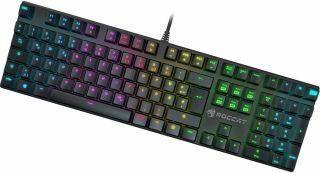 RGB backlighting on mechanical keyboards seems to be the trendy option right now—the question is how much more are you willing to pay for additional color options versus a single-color backlight? That's a question anyone interested in Roccat's Suora plank will have to answer when the Suora FX releases to retail later this year. The Suora FX is slated for a December release with an MSRP set at $140 (€140). That's $40 higher than the Suora released last July, or $60 higher if you do a bit of price shopping (Walmart has the original Suora listed online at $80 through a third-party seller). What that premium gets you on the Suora FX is per-key RGB backlighting infused into the same frameless aluminum deck as its non-FX predecessor, along with quick-toggle preset lighting effects. The F1 through F4 keys cycle through wave, breathing, ripple, and solid lighting. Beyond RGB bling, the Suora FX appears to be the same compact keyboard as the Suora with an anti-ghosting matrix, 1,000Hz polling rate, half a dozen programmable macro keys, and a game mode button that launches custom gaming profiles. Roccat didn't specify what brand of mechanical switches are on the Suora FX, though we suspect they'll be TTC like the original Suora. You can pre-order the Roccat Suora FX with Blue or Brown switches now on Amazon. It will ship on December 6.